Confirming the Monday morning incident, a local administration official Jean Claude Rwagasana told the Nation that there were no survivors. "The falling of debris killed all 14 people at the mining site. Rescuers were not able to find anyone alive. It is a very unfortunate event and we send condolences to the families of the deceased," Mr Rwagasana said. 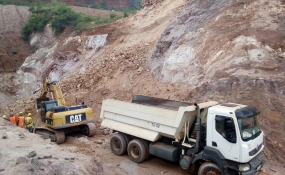 Last year, the Rwanda Mines Petroleum and Gas Board introduced stringent law in a bid to ban artisanal mining saying the regulation is intended to attract "serious" investors who can afford modern practices that are not harmful to the environment and the miners. The mining sector generated $373 million in revenue from its principle minerals -- cassiterite, coltan and wolfram, in 2017 up from $166 million the previous year.